Shop Hosa Insert Cable 1/4 Inch TRS to Dual 1/4 Inch TS from AMS and enjoy Fast & Free Shipping. Modern Mixing consoles use Insert jacks that allow you to break into the signal path to add an outboard signal processor (reverbs, delays, compressors, etc.) using just one cable, which connects to both the input and output of that device. The Hosa Cable STP202 TRS To Dual 1/4 Inch Insert Cable connects to your mixer's Insert jack (with the TRS end) and the Input and Output of your signal processor on the other end (with 1/4 inch phone jacks). Hosa Technology cables and adaptors purchased in the U.S.A. are warranted by Hosa Technology, Inc., to be free of defects in material and workmanship for the lifetime of the original purchaser. Headphones, patch bays, footswitches, microphone stands, equipment racks and console lamps are warranted for one year from date of purchase to be free of defects in material and workmanship. In the event of such defects, the Hosa product will be repaired without charge or, at our option, replaced with a new one if delivered to HosaTechnology, Inc. prepaid, together with the sales slip or other proof of purchase date. This warranty excludes defects due to normal wear, abuse, shipping damage, or failure to use the cable in accordance with the instructions. Hosa Technology, Inc. shall not be liable for damages based upon Inconvenience, Loss of use of the cable, Loss of time, Interrupted operation or commercial loss, or any other damages, whether incidental, consequential or otherwise. This warranty gives you specific legal rights, and you may have other rights which vary from state to state. Q: Are molded cable terminations as rugged as metal ones? A: Hosa offers both molded and metal head-shell assemblies in many configurations. The injection-molded cable terminations, for which they have become famous, have a built-in strain relief and carry Hosa's no-questions-asked Limited Lifetime Warranty. Recording studios, stage racks, keyboards, effects devices--all can be connected with molded assemblies like Hosa's CPP-, CPR-, and CRA-series cables and snakes which perform just as well as much more expensive cables with metal-headshell assemblies. For applications where a cable undergoes repeated stresses--like a guitar cable, for example, which is subject to constant movement and possible strain at the ends when the guitarist reaches the end of his rope - Hosa recommends a specially-constructed guitar cable such as their GTR-400 Series, which encorporates a metal headshell with an internal strain-relief aided by an external shrink-tube which effectively bonds the headshell assembly to the cable itself for excellent protection from high-stress accidents. 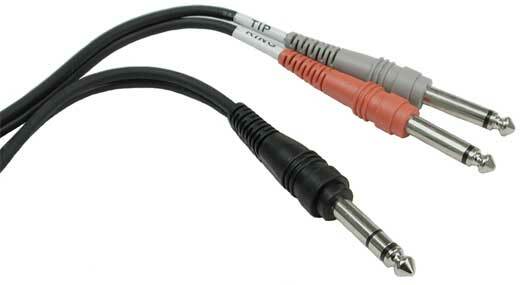 Q: Why are most Hosa cables less expensive than many other brands? If I pay more for a cable, won't it sound better? A: Hosa began business in 1984 with the belief that less-expensive doesn't have to mean cheaper, and that it simply isn't necessary to connect your equipment with NASA-approved, gold-plated cables thick enough to tow an eighteen-wheeler. So, if you can't afford to spend a week's equipment allowance for a few cables, then look no further than their regular Hosa brand for professional cables that work as hard as you do. In the regular Hosa line, they pay strict attention to the basics of cable design and construction. Hosa makes sure that they're well-shielded from external sources of radio-frequency and current-induced noise and that they're of the proper gauge and of high copper purity to ensure low capacitance. In addition, Hosa usea correct soldering techniques to eliminate cold-solder joints which could cause intermittent connections or ground hums. And finally they make sure that the jacket and head-shell/strain-relief combination are rugged enough to withstand the rigors of the intended application. Hosa provides all of these benefits in every cable they make, and they back them up with a Limited Lifetime Warranty. Hosa's injection-molded cable terminations, for which they have become famous, have a built-in strain relief and carry their no-questions-asked Limited Lifetime Warranty. Recording studios, stage racks, keyboards, effects devices--all can be connected with molded assemblies like their CPP-, CPR-, and CRA-series cables and snakes which perform just as well as much more expensive cables with metal-headshell assemblies. Pretty straightforward product and durable. works well, just wanna say my service with A.M.S. ALWAYS GOOD! For me it was just what the doctor ordered. I needed to combine to mono outs to one stereo in. Perfect! These cables are much better than they seem! For the price it is good! Hosa seems to make good cabling although SILENT KNIGHT has them beat hands down! AMS only has the 1/4 input cord though and I am not sure if they make this type? Oh so easy a baby can use it!